Background: A wide-ranging debate has taken place in recent years on mediation analysis and causal modelling, raising profound theoretical, philosophical and methodological questions. The authors build on the results of these discussions to work towards an integrated approach to the analysis of research questions that situate survival outcomes in relation to complex causal pathways with multiple mediators. The background to this contribution is the increasingly urgent need for policy-relevant research on the nature of inequalities in health and healthcare. Methods: The authors begin by summarising debates on causal inference, mediated effects and statistical models, showing that these three strands of research have powerful synergies. 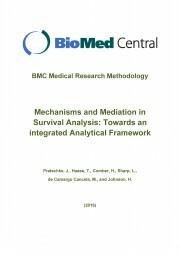 They review a range of approaches which seek to extend existing survival models to obtain valid estimates of mediation effects. They then argue for an alternative strategy, which involves integrating survival outcomes within Structural Equation Models via the discrete-time survival model. This approach can provide an integrated framework for studying mediation effects in relation to survival outcomes, an issue of great relevance in applied health research. The authors provide an example of how these techniques can be used to explore whether the social class position of patients has a significant indirect effect on the hazard of death from colon cancer. Results: The results suggest that the indirect effects of social class on survival are substantial and negative (-0.23 overall). In addition to the substantial direct effect of this variable (-0.60), its indirect effects account for more than one quarter of the total effect. The two main pathways for this indirect effect, via emergency admission (-0.12), on the one hand, and hospital caseload, on the other, (-0.10) are of similar size. Conclusions: The discrete-time survival model provides an attractive way of integrating time-to-event data within the field of Structural Equation Modelling. The authors demonstrate the efficacy of this approach in identifying complex causal pathways that mediate the effects of a socio-economic baseline covariate on the hazard of death from colon cancer. The results show that this approach has the potential to shed light on a class of research questions which is of particular relevance in health research.